Who started the Montessori Method? Does Montessori employ current research and theory in educational methods? For whom is the Montessori method designed? What is the difference between Day Care, Nursery Schools and Preschools? What is the best age to start a child in a preschool? How is a Montessori Pre-Primary school different from other Preschools? With all the freedom, isn’t there confusion? Why does Montessori School run five days a week? How long is the school year? How do Montessori children adjust to public schools? Do you encourage parent involvement in the school? What is the training of the staff? Does Montessori School of Regina, Inc. provide transportation for its students? When are Child-Care receipts issued for Income Tax purposes? What is included in the receipts? Does the East location offer full-day school for children under four years of age? Are you affiliated with Beth Jacob Synagogue? Is the East location affiliated with Wilfred Hunt School? Over 100 years ago, Dr. Maria Montessori was one of the first female medical doctors in Italy. She observed the child’s effortless ability to absorb knowledge from their surroundings and their tireless interest in working with their hands. She saw how children teach themselves. Based upon her observations, she developed unique materials, within a self-creating, child-centered environment. Dr. Montessori was one of the first people to revolutionize educational thought by stressing respect for the child, freedom of expression, self-education, and training through the use of movement and the senses. The Montessori Method of education is basically a unique approach to learning. Rather than “teaching” the child concepts, an environment is designed to stimulate the child’s interest and facilitate their understanding and learning capacities, spontaneously, with little-to-no adult intervention. Montessori is not a static or closed system of education. While there are certain didactic materials and methods that have been proven effective through the years, Montessori is as much an attitude about education and children as it is a specific method. The Montessori method has no distinction of class, culture, background or academic readiness. It has been used, successfully, in all parts of the world, in all types of programs, across all socio-economic levels. Day Care Centres are generally for the purpose of caring for children on an all-day basis. Nursery Schools are generally experiences in socialization and play. Preschools are oriented towards educational experience combined with socialization and play. Most educators and psychologists today agree that the single, most important period in the development of a person’s intelligence occurs between birth and age five. A child’s mind is extremely absorbent and their curiosity is at a peak during these early years. When properly nourished and stimulated, the child’s mind forms patterns for learning that serve him/her well throughout their life. The Montessori system of pre-school education has proven to be one of the most effective and fastest growing methods to guide a child through these critical years. 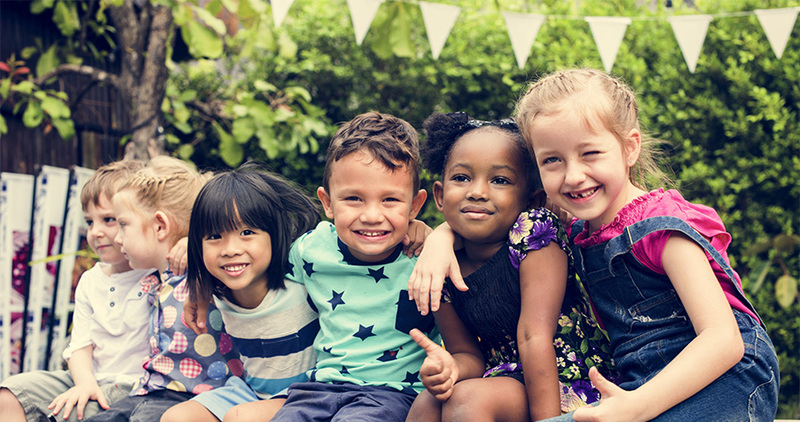 Maria Montessori outlined various periods of “sensitivity.” During these times, a child is more capable of and interested in learning specific concepts. At age 2.5 to 3.5 a special sense of order, concentration, coordination and independence begin to emerge. This time is ideal to begin a child’s training in Montessori as s/he is at the perfect period to build a strong foundation for future learning. Preschool-aged children do not need direct teaching in order to learn. What Dr. Montessori referred to as the “absorbent mind”of children is at its peak receptivity during the preschool years. In most preschools, a teacher teaches the children educational concepts within a group setting. In a Montessori Pre-Primary classroom, the children learn concepts, spontaneously, as they work independently with the many specialized materials within the environment. The Montessori classroom is a child-sized world. Through careful selection of developmentally appropriate materials by the teacher, an environment is set up that allows the child a place to explore life on a level s/he can understand. The materials or exercises are designed to stimulate independent exploration. This prepared environment entices the child to proceed at their own pace from simple activities to more complex ones. Through this process, the child’s natural curiosity is satisfied and s/he begins to experience the joy of discovering the surrounding world. Socialization is very much a part of the Montessori method. Whether in the classroom or outside, you will notice children of different ages and abilities interacting continuously, choosing to work on projects or playing together. Often you will see older children helping younger ones. Because of this interaction, the children learn to take responsibility for themselves and each other. The classroom is a thriving community where children learn to treat one another with respect and dignity. At times the entire class is involved in group activity, such as singing, movement or storytelling. The Montessori Teacher facilitates the classroom or outside activity. S/he carefully plans the environment in the interests of the children and helps them progress from one activity to the next. Trained to deal with children, individually, the teacher allows them to choose from many activities within their range of ability, then work and enjoy the satisfaction of their own discovery. The concept of freedom in the classroom is a freedom within limits. A child is allowed to work freely so long as s/he does not disturb others. Children who have the freedom to follow their interests are generally happy and busily involved in their work. The Montessori classroom experience is for five consecutive days in order to allow the spontaneous learning of the child to flow, smoothly. A child taken in and out of school every other day does not have the same opportunity to pursue their unfolding interests. We are a not-for-profit school and all tuition goes towards running the Montessori School of Regina, Inc. Traditionally, tuition in Montessori preschools, throughout the country, is sometimes higher than other schools, because of the extensive materials, encompassing environment, curriculum and trained staff. Many educators believe that it is wiser to invest in a child’s preschool education than their university education. The expense now is a long-term investment. The regular program begins in early September and continues through June. The Montessori School of Regina, Inc. follows the Regina Public School calendar. Children who have been in a Montessori environment are generally very flexible and adjust quite easily to public school. Any of the studies we have seen reflect this. Montessori students may be better students and spend their time in more productive ways because of their self-direction and positive attitude towards learning. We encourage parent involvement through conferences, observations, discussions, parent evenings, assisting in the classroom, making materials, etc. The staff feels that the more parents can understand the experiences of the child in the classroom, the better able they are to follow through at home. Each classroom is headed by a teacher who has had specific Montessori training from an Approved Montessori Training Centre. All assistants are selected on the basis of their awareness of and dedication to the principles of child development. Unfortunately, we do not provide transportation for the children. Parents are responsible for transporting children to and from school. Lunch Care fees are for supervision only. Parents must provide their child with lunch. Child-care receipts are issued by the end of March each year. The include Pre-Primary, Extended Hours, and Summer Camp fees. The East location of our school does not offer full-day school for children under the age of four years. Even at the age of four, it full-day attendance is permitted at the discretion of the teacher. However, our south location does offer a program called Creative Arts that supplements a child’s half-day school program with a more relaxed environment. Creative Arts is a half-day program that supplements the half-day school program. Therefore, it provides full-day care for parents who require all-day care for their child(ren). The program is set up somewhat similar to a Montessori classroom, but offers a more relaxed and creative environment. The south location of our school is housed in the same building as the Beth Jacob Synagogue. The east location of our school is housed in the same building as the Wilfred Hunt School.